Hope Reins was a winding one, full of failed attempts and closed doors that never quelled his exuberant optimism for life. One snowy winter day in early February 2010, we bundled up against the cold, hooked up the trailer and with great expectations, started the long drive north to Virginia. 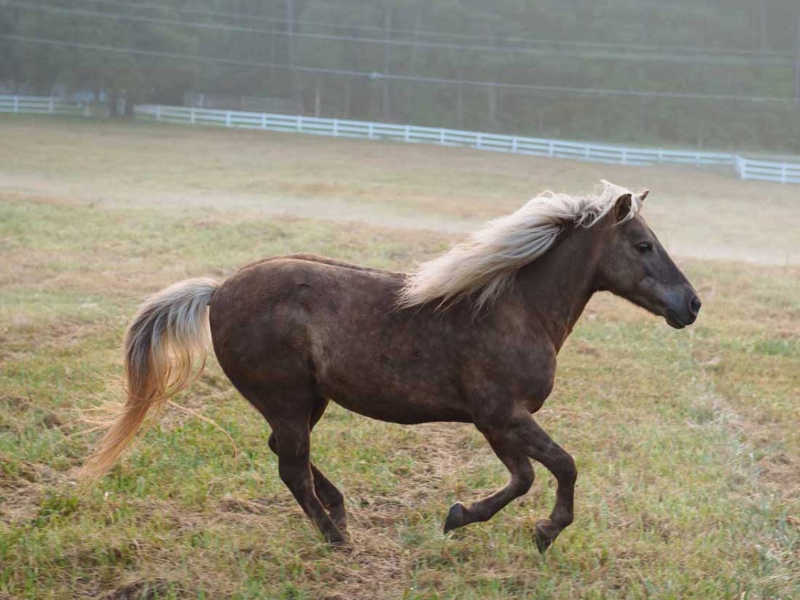 We were on our way to visit a little Shetland pony who, from the description in his classified ad online, appeared to be the perfect first horse for Hope Reins. clear that Baby Pony was too much pony for the little girl to manage. So, he was once again moved on into an uncertain future, with no clear place in the world. Some might have been discouraged by this – but not Gabe! It was plain to see that he was eager to be friends. He came right over when we offered a hand through the fence to greet him. His owner, after hearing that he would be the first of many in the Hope Reins’ herd to serve hurting children, generously decided to donate him to the program completely free of charge. Baby Pony – who we promptly renamed “Gabriel” or “Gabe” – leapt with gusto onto the trailer, eager to see what new adventures awaited him next. Gabriel means “God is my Strength,” and after discovering this fun-loving pony’s eccentric and optimistic personality despite the many obstacles in his path, it seemed to be the perfect name for him. Gabe connects immediately with children who have high energy and love to play. In turn, they find in him an eager friend and companion. He’s also a blast to play with at liberty – meaning free without a halter or lead rope in the round pen. Gabe’s desire to connect with people combined with his mischievous nature make him the perfect playmate for children thirsting for friendship. When Gabe chooses children and approaches on his own, their eyes twinkle with such great satisfaction. His enthusiasm for life is contagious, and he brings joy into the dark places of a child’s heart by just being himself, all the while pointing to One who offers an even greater friendship. For many kids, being with Gabe is like the whisper of a promise, the shadow of the substance of the True Friend, Jesus – the Greatest Friend of all. with my song I praise him.